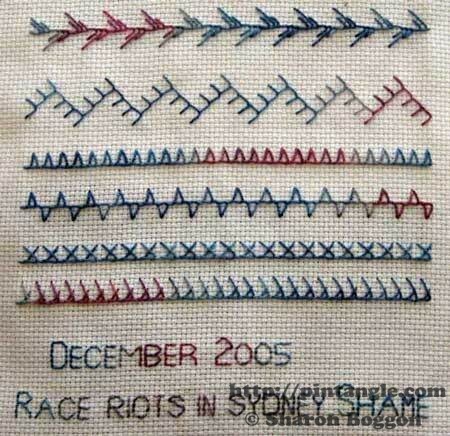 I in January 2009 I started the process of documenting a band sampler which I call For the Love of Stitching. There are a considerable number of ideas, colour schemes and patterns recorded on the sampler along side quotes and autobiographical story fragments. I call it a freeform sampler. Each section of the sampler is stitched with not much planning. The For Love of Stitching Band Sampler is 15 cm (6 inches) wide. It consists of different strips of fabric that are stitched together to form one long strip of needlework. Here you can see it exhibited in 2014 at the Embroiderers Guild ACT exhibition. You can get a sense of how long it is as you can see I trouble fitting it in the frame. For years I have worked samplers as a personal reference and teaching aid. I stored samples in plastic page envelopes in folders decorated with hand embroidery. Many people use this method successfully but I found I was not referring to the information stored in the folders. I did not reach for them often. When stitching I was more inclined simply to repeat what was familiar and not refer to past experiments. This meant I forgot them. I decided to try something different with my ‘doodle cloths’ and stitch explorations. I started to work band samplers that were for use as reference rather than decoration. By sheer chance on the first sample I worked I named and signed the sampler. I had no thought at the time that I would stitch so many samplers! I simply stitched “For the love of Stitching” so later after many years that became its name. I kept them pinned to the wall in my studio. Because I could see my samples I used them as a sampler is meant to be used, as a record of stitches and ideas that can be referred to. I have found it is easier to travel with them like this. A pile of teaching samplers stored like this are lighter and more compact than being housed in folders. Why did you stitch them together? I like to hand out samplers to students in workshops and lectures as people learn by touching. Unfortunately a couple of samplers were handed out, but never came back. I stitched them together in one long strip so no one could stuff it in their hand bag. To a degree this is a security measure but the other advantage is that odd samples don’t get lost. What size will it be when done? I dont know I will stop when I get bored with playing with it! Is it all hand embroidery? Yes it is. I love hand embroidery and really it has become an excuse to experiment with and explore stitches. What fabric do you use? Normally I use either 25 cnt linen, 28 cnt linen, or Aida but some pieces are worked on other fabrics. Tea towel linen, dress linen, evenweave linen, Aida, hardanger fabrics, Lynda, and dress cotton are all represented in the sampler. Often pieces have been hand dyed or hand painted. 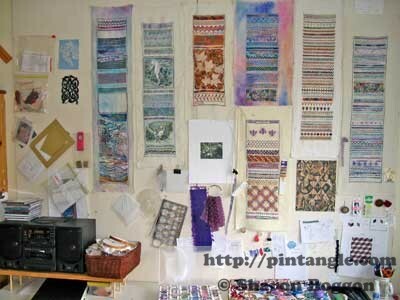 In some cases I have patchworked together fabrics then used it as the foundation cloth of the sampler. In this photograph you can see what I have done. I pieced together 25 cnt linen, cotton flanelette, Aida, hardanger fabric, table cloth linen and tea towel linen. All the pieces have been hand dyed by me using procion dyes. They were scraps and left overs from other projects and I felt I was not wasting anything by experimenting on them. The tacking stitches down the edge mark the edge of the sampler itself. This helps prevent me stitching into the seam line. The white fabric along the side is scrap sheeting that I added so I could easily get the strip of fabric on a hoop. After the sampler was stitched I trimmed the scrap sheeting off and proceeded to back it. A large variety of threads are also represented from wool, silk, cotton, stranded floss, perle cotton, and so on. Each band is different. Although I use commercial threads many are hand dyed by me. I use procion dyes on both the fabric and threads. If you want to know more about the process you will find information in how I Extended and backed the sampler in this article where I photographed the whole process. Do you plan your sampler? To be honest sometimes a plan a little the other times not at all. I try and keep things as simple as possible because I have found the more complex the project becomes the more I am less likely to do it. I will either look at it and think it’s all too much, or start it with a flurry of enthusiasm and then tire of it and I then have a UFO on my hands. So with my sampler there is no rules. I change, fabric, stitching style, colour, thread type whenever it feels right. I call it freeform improvisational samplering for a reason and it suits me. I journal on it when I feel like it and not when I dont. The only rule I have is its width. In other words in my head I say I am going to stitch a sampler 6 inches wide. That is it! I decide everything else as I go. Why is the sampler 6 inches wide? My band sampler is 6 inches wide because in my hand a 8 inch hoop feels the most comfortable. While on the hoop the actual fabric is about 9-10 inches wide. Deciding what width the sampler is important because it is about what feels right in your hand. 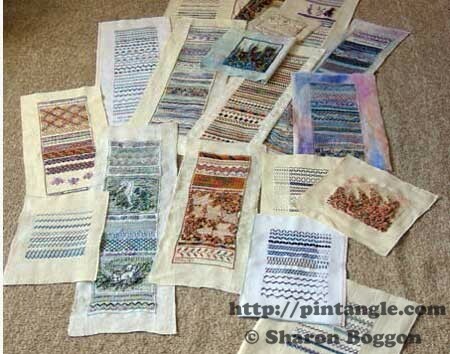 If you are thinking about one of these types of samplers my tip is to choose a width that you can easily experiment on. You need to be able to stitch a bit, then move on. You don’t want the sampler so wide that it takes an age to cover the area and you are tired of it after a row! You want to be able to experiment, enjoy it then try something else, enjoy it and move on again – painlessly! I use a hoop or occassionally I put the sampler on a small stretcher. Mostly, however I use a hoop. My tip is to choose a fabric width that allows for a hoop that feels right in your hand. Many people make the mistake of choosing a hoop that is too big. I find an 8 inch hoop is about as large as I want which means a 6 inch sampler width is good. Some hoop sizes will feel to big others will feel cramped so choose a size your hand is at ease with. Try a few scrap cloths and just see what feels right. Once the hoop size is decided subtract by 2 inches. So if you choose 8 inch hoop – make your sampler 6 inches wide. If you choose a 7 inch hoop make your sampler 5 inches wide. 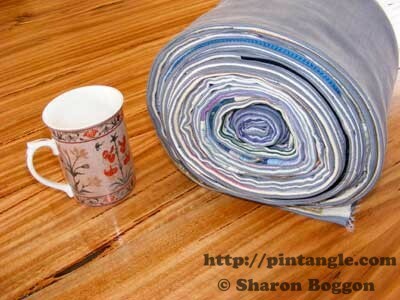 What ever width you decide on you will need a few inches of fabric either side to allow for the hoop. It’s not complex or difficult or mysterious. It is simply the width of the sampler plus a few inches so I can hoop it. The sampler marks incidents or moments in history in text. Discovering that what is recorded becomes more interesting over time I have continued to mark events and personal history as it happens. 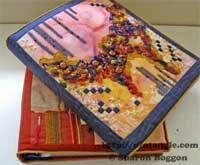 For instance above is a sampler I made after the 2009 Bush Fires in Victoria (Australia). Here is another sampler made in the Autumn of 2009. It records what was in the news constantly. I listen to the radio as I stitch and it seemed to me that all the conversation was about Peak oil, Climate change and the ongoing global economic crisis. I live in Australia so our Autumn is March and in that month there is also St Patricks day and we observed earth hour. As readers can see this long band sampler has become more than a record of stitches and techniques but over time has become a contemporary freeform journal sampler as well. As I stitched this section I realised how much of a journal/autobiographical story the sampler had become. 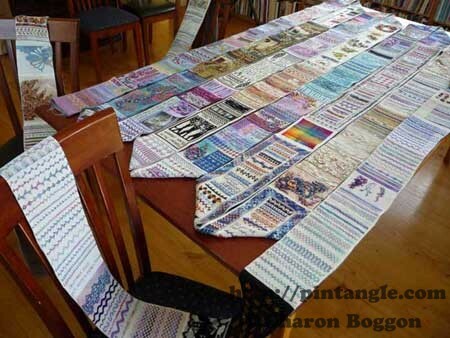 Is this sampler the longest in the world? With 7,000 people stitching it certainly is an amazing community based project. 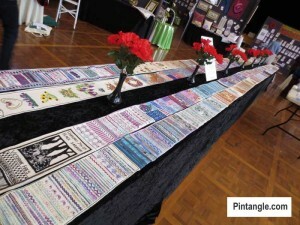 I find it interesting that the Longest embroidery in the World is hand stitched and not an individualistic project but something a group of people did together. how wonderful, what an achievement ! Sharon as you know I have only recently started looking at your Fb posts but I think your sampler is an absolute joy and inspiration to so many of us. I love that it is just 6 inches wide. It seems so manageable at that size! I also love the way you have made it a journal too. Wish I had started when I was younger with all the life events shown. (63 now)! You are so generous with your expertise. Thank you! I *LOVE* your sampler band. i think maybe 6 inches wide is a good width. I just did a crazy stitch sampler that was 8 inch by 8 inch square. It doesn’t sound big, but it was. And I had to move the hoop. I choose that size because I cut my material 12 inches wide and very long. I considered on just continuing down the long piece, but didn’t. However, I kind of like pieces hung on the wall for reference, but also like the band idea. Hmmm… Decisions. Thank you for sharing your wonderful work. By the way, I think you might have the longest *individual* sampler band. Thanks for your lovely comment. I have found 6 inches to be very practical – it will fit an 8 inch hoop which is a very easy size to use. I would test the width first then decide as if you find it too wide you will not continue doing it. Anyway Have fun it is a very rewarding way to learn stitches! I have been trying in vain to read The Tale of Two Samplers on your former web site. Do you still have access to that information. A friend gave me one of Dorrit’s autographed boxes which had belonged to her mother and I was going to take it to our EGA Show and Tell with, hopefully, a bit of information. thanks in advance and this site looks great! 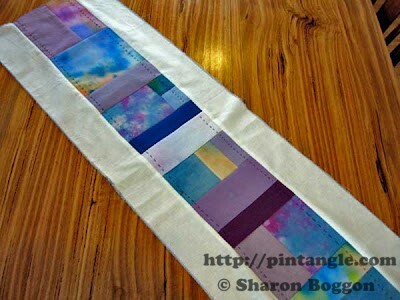 Wow that is wonderful, you have inspired me to stitch my own sampler on a roll! Thank you !! Sharon, I hit your site by accident, and it is your fault, I can’t seem to leave and get my chores done. I am relatively new to Crazy Quilting, and absolutely love the embellishing process. You are SO talented.. my hope is to become better, but you truly are a shining star!! Thank you for the inspiration and knowledge you share. One totally endearing piece!! What a treasure! I am wondering if there is an online program that can help print my patterns on mesh/fabric that I would then embroider over? What a beautiful piece of work but I work on CANVAS. I love doing the different states on either 14 count or 18 count. Because of 3 now ging to be 4 on Friday, even with magnifying classes I can not go to Congress cloth. Does this mean I should not take any of your other classes besides Artists journal. Even though I am not 100% I want to teach needlepoint using the fun composite embroidery stitches, canvas sie dependent on age of class. Thankyou for all the patience you have in explaining stitches in detail.You inspire me whenever I visit your site. This is a lovely band, and a great ongoing accomplishment. Makes me think of a project to create a stitched diary in page form – similar to your band. The greatest sense I get from reading the history of this band is something I fully relate to – that is, how those of us who love to stitch are fulfilling a need to both expose and express ourselves. Thank you for sharing. Thank you Laurel that is a lovely comment. I keep coming back here – I love your band sampler and it must surely be up for the Guiness Book of Records now? I also love that it has become a place to journal as well making it so personal to you. What an inspiration! Makes me wish I was a lot younger and my hands were not so painful. Thanks Sara for such a lovely comment. Sunday morning here and its nice to open my comments and be greeted with this.No its not in the Guiness book of records but then I have never applied to have it there. Also I have another few strips to add since the last lot. So it will be longer soon. Beautiful words, well said and stitched.